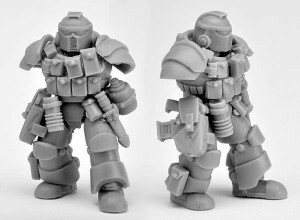 Anvil Industry has a preview photo up of their upcoming Black Ops Steam Lords. Here is a preview of the upcoming "Black Ops" Steam Lords. If you are going behind enemy lines on a long mission, you are going to need some serious equipment! Apart from the Praetorian Helmet, all these components are brand new, including a new Leg armour style and the modern Special Ops Torso. Hoping to release some of these parts later on this week, Its a pretty radical departure from the existing Steam Lords range, what do you guys think?